The Qal'at al-Bahrain, also known as the Bahrain Fort or Fort of Bahrain and previously as the Portugal Fort is an archaeological site located in Bahrain, on the Arabian Peninsula. Al-Qudaibiya Palace or Gudaibiya Palace is a palace in Gudaibiya, Manama, Bahrain. 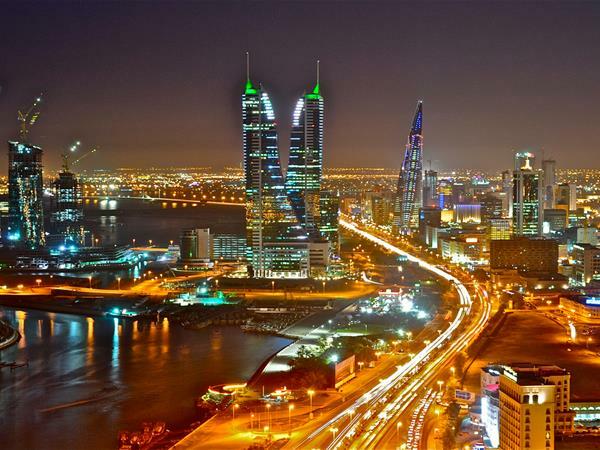 Bahrain Financial Harbour is a large-scale commercial development project in Manama, the capital of Bahrain. The Bahrain National Stadium is the national stadium of Bahrain, located in East Riffa. It can accommodate 41,580 people and is used mostly for football matches. It was built in 1982. The Bahrain World Trade Center is a 240-metre-high, 50-floor, twin tower complex located in Manama, Bahrain. The towers were built in 2008 by the multi-national architectural firm Atkins.